With around 2500 residents, Tinnum is the biggest settlement in the Sylt East region. Tinnum is often described as the “Bridge between town and city”, as the village almost seamlessly adjoins Westerland in the west. Tinnum is located centrally and because of this is a highly productive location for trade and industry. Tinnum is of great importance for the provisioning of guests as well as for tourism on the whole island. Tinnum was first mentioned in 1440 and was the seat of Sylt’s bailiffs between 1547 and 1868. The island prison and the municipal court also used to be located here. The Old Bailiwick, built in 1649, is one of the oldest buildings in Sylt. For a long time Sylt’s bailiffs determined the history of the island from here. This was once also the seat of administration and legal proceedings. Another of Tinnum’s highlights is Tinnum Castle. 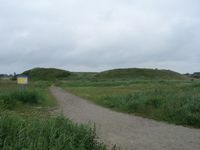 From a total of three castles in Sylt, Tinnum Castle is the most well preserved, as Arschsum Castle was destroyed and Rantum Castle buried under sand dunes. The castle comprises of an eight metre long circular rampart with a diameter of 120m and a perimeter of about 440m. It was built around the time of Christ and is located today in the middle of Tinnum Meadow. Before the marsh was dammed up in 1838, Tinnum Castle protruded from flood waters like an island. In the beginning, Tinnum Castle was probably used as a Germanic place of worship and as a hiding place. Today Tinnum Castle is accessible to visitors free of charge and definitely worth a visit! Especially popular with young and old is Tinnum Zoo, which stretches over 30,000 square metres. Around 400 native and exotic animals have found a new home here. Marvel at the colourful parakeets, flamingos and parrots, at the comical monkeys and docile deer. Children particularly enjoy feeding the animals; special feed can be bought in the zoo. However, Tinnum Zoo does not just offer visitors a fascinating animal world! You can also take a pedal-boat ride on one of the ponds or go for a nice walk. Children can let off steam at the playground or on the giant bouncy castle. In the zoo’s restaurants your family can recharge its batteries with warm meals and refreshing drinks. Tinnum is a wonderful holiday destination for the whole family! From fun and games to regeneration and relaxation, there is something here for every family member!